The Hunter Blu-ray Review. I wouldn’t be Tasmanian if I didn’t feel a little bit proud about this movie and its subject matter. It does have some flaws, but I can still recommend this to anyone who enjoys a good, solid drama, no matter where you come from. Being a proud Taswegian, you might think I’d be naturally biased towards giving ‘The Hunter’ a high score. It’s hard to resist the excitement of seeing your home state on the big screen, or watching stars like Willem Dafoe and Sam Neill shedding light on locales and themes that are as familiar to you as the house you grew up in. But it’s important for a reviewer, a responsible one, to get some distance from that initial excitement. Doing so, for me, has made me see this film for what it truly is: A great little tale, albeit with some flaws. Willem Dafoe plays Martin David, a kind of eco-mercenary whose goal it is to find, kill and obtain samples from the mythical Tasmanian Tiger. His backers direct him to the home of local woman Lucy (Frances O‘Connor) who believes him to be a researcher with an overseas university. But upon arriving at his lodgings, David finds Lucy in a drug-induced stupor and the house run on the whims of her two children, Sass (Morgana Davies) and Bike (Finn Woodlock.) Local personality Jack Mindy (Sam Neill) guides David to the area where he is to begin his search, but on the way he has to cross through areas controlled by Forestry workers and Greenies, who are locked in a dispute over logging. Over the course of his search, the hard-nosed David becomes more and more entangled in the lives of Lucy and the children, and realises that his obsession might not be worth the ultimate cost. Willem Dafoe shines in the more human moments of the story, but he also puts in a terrific performance as the lone hunter. A lot of his scenes take place in isolation, with no other actors to work with; it’s these moments, when what’s really called for is a haunted look into the trees, or a sign of angst, that Dafoe reveals himself to be a true master of his craft. Unfortunately, Sam Neill is under-utilised as the conflicted and confused Jack Mindy. His sub-plot, involving prescription drugs and an obsession with Lucy, is fractured, and ultimately peters out. It’s one of those story arcs that you can see working well in the novel, but it hasn’t translated at all well to the big screen. The question of whether or not David finds the tiger is essential in keeping us engaged- everything builds towards the resolution of that question, making for some genuine suspense. But maybe we’re kept on tenterhooks for too long: There are too many transitional scenes, in which David drives from the bush back to Lucy’s house, or vice versa. Right when you feel like the action is picking up, you’re wrenched away from the scene, and it hurts the pace of the story. Even at 101 minutes, the movie feels long. The Hunter is incredibly beautiful to watch. In a very short space of time, the filmmakers have been able to capture the essence of a place; the people, the conflicts, and the environment, which is almost another character in itself. 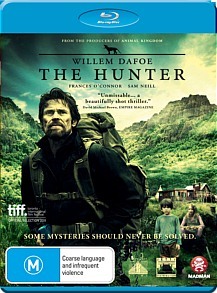 The scenery depicted in the Hunter is truly stunning, with some majestic shots of local landmarks and wilderness. The blue, grey and green colour palette perfectly captures the wild, inhospitable, darkly beautiful nature of the setting. The picture quality is very clean, but there is an ever-so-slight graininess, reminiscent of fog, which only heightens the image of a wild and cold place. The soundtrack is eerily sparse. When it does pick up, it combines moving string arrangements with ghostly bells and percussion, perfectly suiting what’s happening on screen. Making of: We are treated to an in-depth look at each of the characters, as well as the locations and the legend of the tiger itself. Deleted scenes: You can choose to watch these with their original audio, but you’ll probably get more out of them by watching them with commentary, which explains their place in the story an why they were dropped. Portrait galleries: These are accompanied by various tracks from the film’s soundtrack. Atom study guide: A guide for teachers, which can only be viewed on a BD-ROM drive. I wouldn’t be Tasmanian if I didn’t feel a little bit proud about this movie and its subject matter. It does have some flaws, but I can still recommend this to anyone who enjoys a good, solid drama, no matter where you come from.